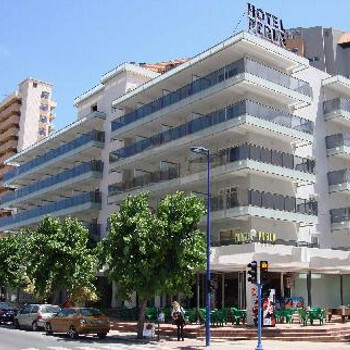 A pleasant and comfortable hotel situated 500 metres from the sea and next to one of the resort's casinos. It provides a friendly and relaxed atmosphere that suits guests of all ages. The resort's centre has a good choice of restaurants, cafes and bars. I have stayed in many different establishments in Bulgaria, and I rate the Perla hotel as one of the very best for the middle-budget traveller. I have stayed there on at least six different occasions since 2004 and I have been so impressed with the friendliness of the staff at the Perla that even though I now own my own house in Bulgaria, I still frequently visit the Perla simply to chat with the every-so-friendly hotel manageress and other members of staff, or to have a drink or a meal in a most friendly place with plesant, relaxing surroundings and lovely atmosphere. Excellent and plentiful selection of breakfast food, with both a varied menu and specials, for all other meals. First class room cleanliness, with friendly honest cleaners. Set in beautiful surrounds, this hotel has something to offer everyone, from the single traveller to the family group. Entertainment varies from poor to excellent, depending entirely on what may be on at any particular time. However this is not a problem as at the hight of the season, the party area of Golden Sands there is a free nightly family show, and is less than ten minutes walk from the hotel. Also when the Perla puts on the 'Gala' shows, just be there, don't miss it. We stayed at this hotel and were very impressed, the hotel room was nice, the cleaners pleasant and the staff in general were great. The cleaners were in everyday and they made things such as swans out of the towels which we thought was very clever. Breakfast was fine there was always something there for you to eat if it is not to your taste it is cheap enough to eat out. No entertainment in the hotel. Will be staying here again next year. On first impression the hotel pearla was just magnificant, the grounds and reception was breathtaking. We found the staff to be extremely polite,helpful and friendly. The rooms were basic but spotless with a personal touch, compliments to the hotel staff. I hope to return September 06 with more of my family members. We stayed at this hotel for 1 week at the start of July on a bed and breakfast basis. On arrival porters were excellent. Overall the service offered by staff was excellent. We were in the 3 star part of the hotel. Room had a pool view, was a good size. We had air conditioning, mini bar and tv. Whilst we were there most of the guests were German, but I dont know if this is only because it wad before the English schools came off for Summer. We stayed in the 2 star part of the hotel which although clean was basic and small. They were cleaned everyday and on the whole quiet at night, except at weekend when you can hear an open air disco going on until the early hours of the morning.There are many nationalities staying there which reflected in the entertainment the hotel provided. Plenty of choice for breakfast, with a nice patio area you can sit out and eat at your leisure. Didn't use the pool as there seemed to be mainly adult susing it,so went a five minute walk down hill and used a different pool more child friendly. I would use the hotel again but stay in the 3 star part, bigger rooms. The hotel is in easy walking distance of the water park .